In all honesty, I've never really had 'blog goals', though I feel like I probably should. Blogging is something I do as a kind of hobby, I enjoy it and it makes me happy - but when it doesn't make me happy any more, I won't do it. My posts are sporadic and I don't get to make as much mail art as I'd like to and post about it or make as many comments on blogs as I'd like to. Regardless, I really like blogging and this incredible blogging community and it is a pleasure to be a part of it. + Various fonts from; Dafont. 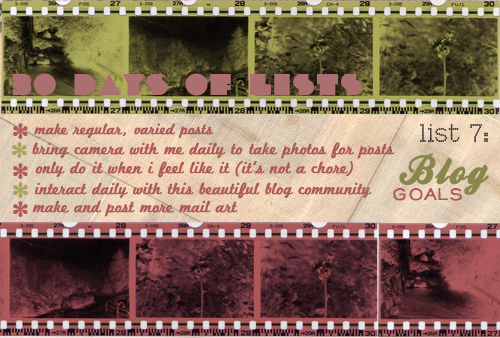 + Join in on 30 Days Of Lists here.